The Chennai Super Kings have an extremely passionate set of fans supporting them. Despite them missing out on playing in 2016 and 2017, the fans did not leave their side and continued to support them through thick and thin. There are a few fans, who go to another level to showcase their support for the team. Such fans, known as Super Fans, come up with innovative ways for supporting their side. 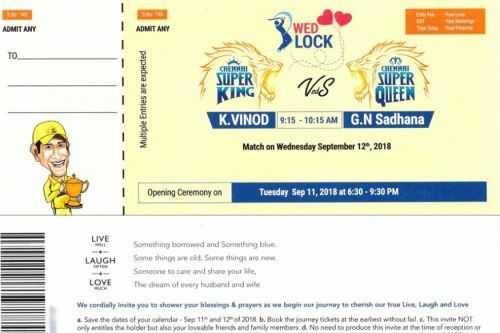 One such super fan, K Vinod, took his support to such a level that he printed his wedding card in the form of a CSK match ticket. All the details on the card were presented in such a way like it was an actual cricket match taking place. The CSK official Twitter handle had posted the picture of the card on their website and even congratulated Vinod. The wedding took place on September 12. Speaking to the CSK website, Vinod opened up about his wedding invite. "Being a super fan of MS Dhoni and Chennai Super Kings, I wanted to come up with something unique as my wedding invite. I spoke to a friend who is a graphic designer by profession and also a CSK fan, we zeroed in on this," he was quoted as saying by the Chennai Super Kings website. Vinod has been involved with a lot of official videos for the side and was even presented with a signed bat by MS Dhoni. "CSK officials surprised me in 2015 when they called out my name, at the conclusion of our last home game and I was presented with the bat signed by Dhoni," he said. CSK made a miraculous return to the IPL this year, winning the title by defeating the Sunrisers Hyderabad in the final. IPL 2019: Match 25, RR vs CSK, Match Prediction: Who will win today's match?